The Kyoto University Library Network is composed of the Main Library, also referred to as the University Library, and more than 50 libraries of various faculties and research institutes. For details, please check List of KU Libraries. Regular students (=degree-seeking) may use a student ID as a library card. To activate your student ID as a library card, please submit "Kyoto University Library Card Registration Form" to the Main Library. Regular faculty and staff (full-time employment) may use an employee ID card as a library card. Other Kyoto University members (emeritus professors, adjunct faculty, research students (=non-degree)) need to apply for library card. Please submit "Kyoto University Library Card Registration Form" to the Main Library with your ID. A library card is common in all of KU Libraries. Please refer to? 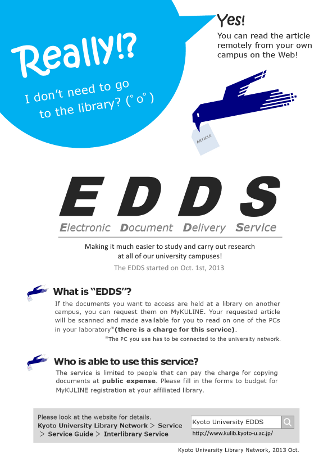 the?Service Guide for non-KU users & the List of KU libraries (for non-KU users). You can search KULINE (KU Libraries Catalog) to find books and periodicals held in the KU Libraries. And you can search CiNii Books (National union catalog of Japanese universities and institutes). In addition, you can use Electronic Journals and Bibliographic Databases. KU members can borrow books. When you borrow books, your library card is required. Some libraries have the automatic check-out machine. Please return books in the loan period. In case you fail to return books by the due date, you might be penalized by losing borrowing privileges for a certain period. In principle, rare books, doctoral theses, reference books, periodicals, micro materials and audio-visual materials are not available for borrowing. A book out on loan can be reserved and then used as soon as it is returned. In some libraries, we accept an online reservation. For information, check an Information of reserving/renewing a book, List of KU libraries. You may renew books for one more loan period if no one else has requested it. Please apply at the Circulation Desk before your due date. In some libraries, we accept an online renewal. For information, check an Information of reserving/renewing a book, List of KU libraries. * Policies on library service vary from library to library. Please check List of KU Libraries for detail. Please return books to the library which you borrowed them from, as a general rule. Inter-campus Return Service is NOT available if both the sending and the receiving library are in the same campus area. However it is available between Yoshida Campus North Area and South Area, between Yoshida Campus North Area and Yoshida-South Area, between The Library of the Institute for Research in Humanities and 5 libraries in Yoshida-South Area(Medical Library,Library of Human Health Sciences,The Library of Graduate School / Faculty of Pharmaceutical Sciences,Library of the Graduate School of Asian and African Area Studies, Library of Center for Southeast Asian Studies), between Medical Library and Library of Human Health Sciences, Faculty of Medicine, and between libraries in Katsura campus. If you borrow books through Inter-campus loans, you must return them to the library that you receive them. * If you want to pay at public expense, please ask your affiliated library. *Some libraries have a prepaid-compatible copy machines (the same as one in the Student Co-op Copy Center). This service is available only to KU members. In some libraries, we accept an online ILL application. See: "List of KU Libraries which accept online ILL applications." We started trialing the new “EDDS” service on Oct. 1st, 2013. The service is limited to people that can pay the charge for copying documents at public expense. You can request a book or copies of articles in journals that are held by KU Libraries, but not held at your home campus. It will be available for pick up at your faculty library or main library. Photocopies will be charged 15-20 yen/page. If you want to pay at public expense, please ask your affiliated library. Borrowers are responsible for returning items by their due date. People with disabilities or those who have difficulty accessing the library can request that books be delivered to their nearest library from anywhere, regardless of the distance from the library. Please make an inquiry in the first instance at your departmental library. 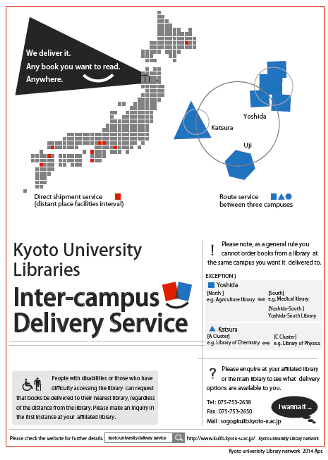 Materials unavailable in KU Libraries can be ordered photocopies from other libraries in Japan or overseas. The cost will be charged. If you want to pay at public expense, please ask your affiliated library. Books unavailable in KU Libraries can be ordered from other libraries in Japan or overseas. The cost will be charged (postage etc.). If you want to pay at public expense, please ask your affiliated library. The lending library may specify conditions for use of material, such as "no copying permitted" or "for use in the library only". * Some materials may not be available for borrowing, such as bound books, books out on loan, or resources owned by a research laboratory. When you visit other university's library, please check the institution's web site for instructions on how to use the library. Some libraries may require the presentation of student ID or personal ID, and some may require request you to contact them in advance. If you need a letter of introduction (permission to use a library), please apply for it at your home library by 1-3 days before the preferred date to visit.